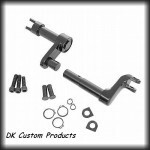 Convert the offset footpeg mount on your Sportster to fit any footpeg you want! BLACKED-OUT Kit of Heavy Duty Steel Clamps and Foot Peg Mounts. 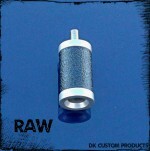 Perfect for Highway Pegs. 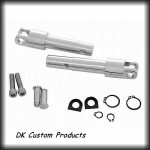 CHROME Kit of Heavy Duty Steel Clamps and Foot Peg Mounts. Perfect for Highway Pegs. 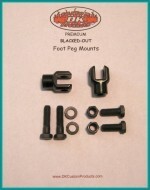 BLACKED-OUT Heavy Duty Steel Foot Peg Mounts. A pair - Black Foot Peg Clevis, perfect for Highway Pegs. 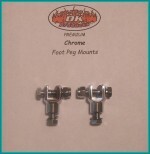 CHROME Heavy Duty Steel Foot Peg Mounts. 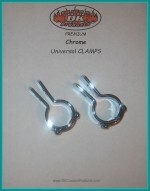 A pair - Chrome Foot Peg Clevis, perfect for Highway Pegs. 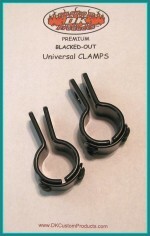 Blacked-Out Heavy Duty Steel Clamps. A pair of 3-Piece Clamps that fit 1.25" engine guards, perfect for highway pegs. 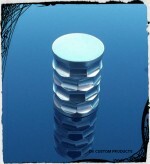 CHROME Heavy Duty Steel Clamps. 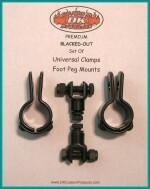 A pair of 3-piece clamps that fit 1.25" engine guard, perfect for Highway Pegs. 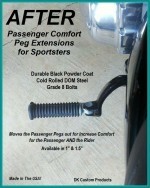 Passenger Comfort Peg Extensions For Sportsters 1"
Passenger Comfort Peg Extensions For Sportsters 1.5"
Passenger Comfort Left Side Peg Extension For 2014 - Up Sportsters 1"
Passenger Comfort Peg Extension For 2014 - Up Sportsters 1.5"
2 Pair of Quick Release Footpegs Pins Replace Stock Harley-Davidson Clevis Pins & Bolts. 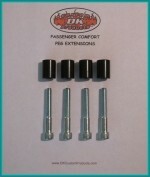 Quick Release Footpegs Pins Replace Stock Harley-Davidson Clevis Pins & Bolts.